Yesterday I completed "Tubby Tug" after 6 months and an estimated 400 hours. 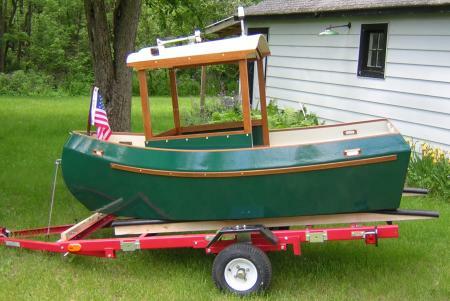 My version is electric powered with an MinnKota trolling motor modified to fit through the hull and under the back seat. The electric controls were re-routed to a "throttle" at the helm station. A modified Teleflex rotary helm provides steering using the spooked wood wheel. The dash configuration includes a voltmeter, speedometer (10 mph max electric trolling unit), and lighted electric panel that controls the running lights, cabin lights, plus a horn and accessory plug. The second button was my 8 year old grandson's idea. 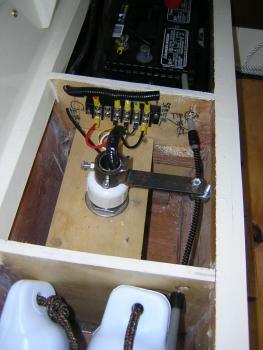 It turns on a Flojet pump mounted in the front compartment, plumbed to a thru hull. Our "water cannon" can fire a stream of water about 40 feet! The cabin design was slightly modified to get avoid the center post. All brightwork is mahogany. My state registration numbers have not yet arrived, but "Cygnet" will be christened on Thursday, June 10th, on Swan Lake near Portage, Wisconsin. A great plan and a great project. Thank you!